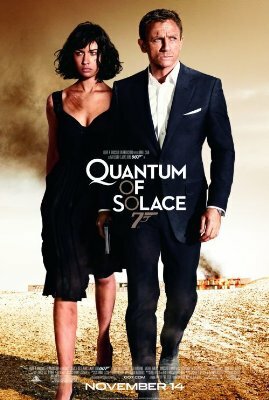 I caught Quantum of Solace last night. It’s a Bond movie, so there isn’t much I could say that would spoil the plot. You’ve got the same formulaic action, shooting, stunts, fights, deaths, and spy stuff as the other installments taking place over land, air, and sea across numerous continents. My opinion closely mirrors Snay’s, so I won’t bother getting into the whole thing. I found the plot more contrived than normal and lacking in the end, partially due to the fact that this is more or less a sequel to Casino Royale. Some of the characters just didn’t fit. There were also many moments of irritation with the camera bouncing around wildly to the point where you can’t tell what’s going on at all. Some people may think it’s artsy or better to draw you into the confusion or craziness of a scene. I’m not a director, but I disagree. Though rendered using modern means, there’s a visual style to the opening credits that kicks back to an earlier era. The sound of Jack White’s title track brings it all together. There is notably less love interest and fewer gadgets for Bond, the latter more disappointing than the former. I’m not talking about the ludicrous spy gadgets that defied belief, but the more practical things like the in-car defibrillator in Casino Royale. The only gadget Bond uses throughout the entire movie is his cell phone, granted that it provides him the ability to track the location of his marks via GPS. Instead, the gadget budget seemed to be spent back at MI6 on lots of neat-looking touch screen CG effects ala Minority Report and The Island. Cool looking, but overly done. After the gritty feel of Casino Royale, I was expecting more.